We strive to provide an ecosystem for students to explore and expand their inherent potential, organically. We believe in that a close teacher- student relationship is the bedrock of a healthy learning environment. Yoga, Kalaripayattu, Music, Dance & Art are an integral part of the curriculum. 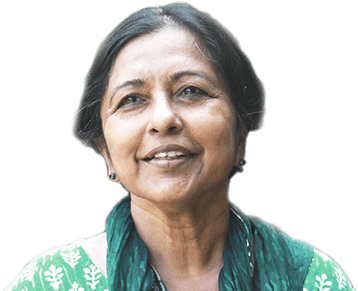 Sunanda Ali has been in the field of education for over thirty years, the last ten of which she has been the Principal of The Peepal Grove School. She has taught in schools for the economically backward, as well as in regular fee-paying schools. She says, “I feel sad at the state of schools in India today.They focus on churning out uniform ‘products’, with an obsessive emphasis on performance and marks. I feel that schools instead should open out the world for the child, encourage her to think on her own and discover things for herself. In the process of discovery, the student will learn how to apply her mind, know the importance of discipline, and consequently do well in her studies also. In the process of exploring what she is good at, she will experience all the co-curricular activities. In the Peepal Grove School, students and teachers learn how to live together and learn from each other, a skill much needed in today’s world riven by friction and violence”. The Peepal Grove School is a project of The Satsang Foundation founded by Sri Mumtaz Ali or M, as he is popularly known. He is a social activist, educationist and a crusader for inter-religious harmony with a deep knowledge of world religions. He has been associated with the Ramakrishna Mission and was a trustee of the Krishnamurti Foundation. 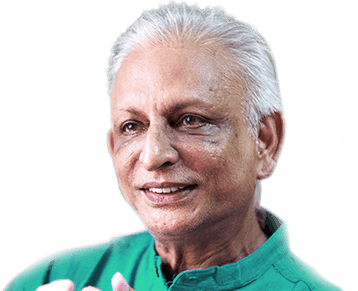 Sri M travels worldwide and holds dialogues with people from all communities and persuasions on the spiritual quest for the multi-dimensional essence of life. His book, “Apprenticed to a Himalayan Master – An Autobiography of a Yogi”, is a modern spiritual classic. He spearheaded the epochal Walk of Hope – a Padayatra from Kanyakumari to Kashmir in 2015-16. Children are sensitive, open-minded and vulnerable. They need to be shown ways and means to gather knowledge and understanding, and learn for themselves. And since learning is associated with space (both internal and external), at The Peepal Grove School, we include experiences like outdoor classes, bird-watching, trekking, painting outdoors (instead of only within the four walls of the classroom) all of which we feel are crucial to the growth of young minds. Here teachers play the role of friendly guides who inspire students through dialogue and discussion, instead of ‘spoon-feeding’ them. That this vision, of learning how to live and learn together in harmony, will be taken forward into the future, we have no doubt. The younger generation of both teachers and administrators have participated in several dialogues and training programmes where they have learnt that to live the philosophy is more important than mere verbal communications. The Peepal Grove School is a unit of the Satsang Foundation. There are no branches or franchisees of the school.